Great look and convenience! 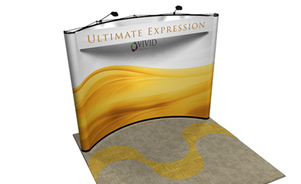 Mirage pop-up displays give you a classic curved look and big, uninterrupted graphics. Mirage is easy to set up, ship, and transport. Frames and channels have a lifetime warranty. The Very Best Frame. Period. 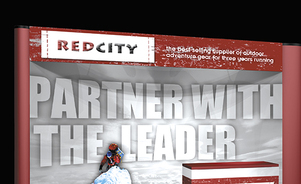 The most durable pop-up frames available. If impacted, Mirage's fiberglass frame flexes and bounces back without damage, unlike aluminum. 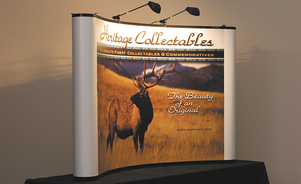 Mirage display frame and channels have a lifetime warranty. 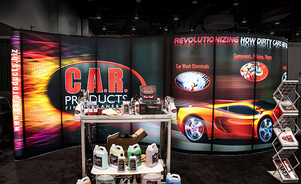 Make an impression on clients and prospects with the highest quality, longest lasting graphics. 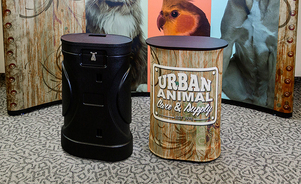 Transform your cases into a branded workstation! 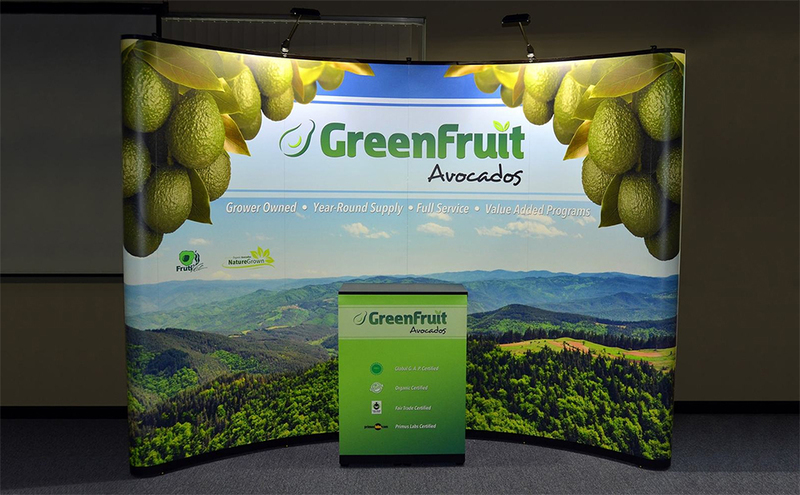 Table top and panels attach quickly and easily with magnets. 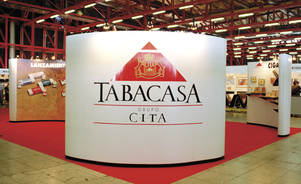 Mirage can be backlit with Skyline LED lighting to attract attention to your brand and message. Bubble Panel gives Mirage a new look and can be backlit for more attention. Easy to install or change out as your message changes. 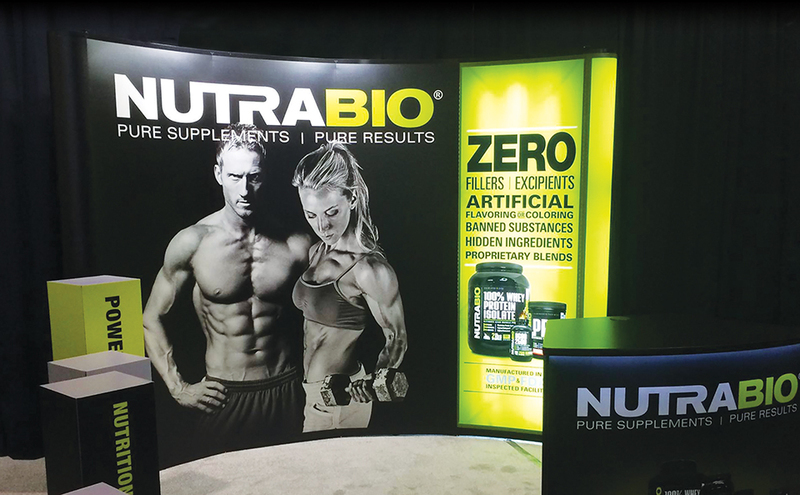 Marquee header spans the curve of Mirage and can be backlit to make your name and message stand out. 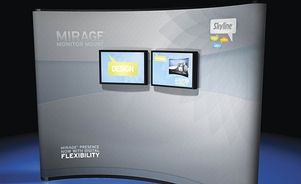 Mirage Monitor Mount allows exhibitors to mount up to two 15 lb. monitors or up to four 10 lb. 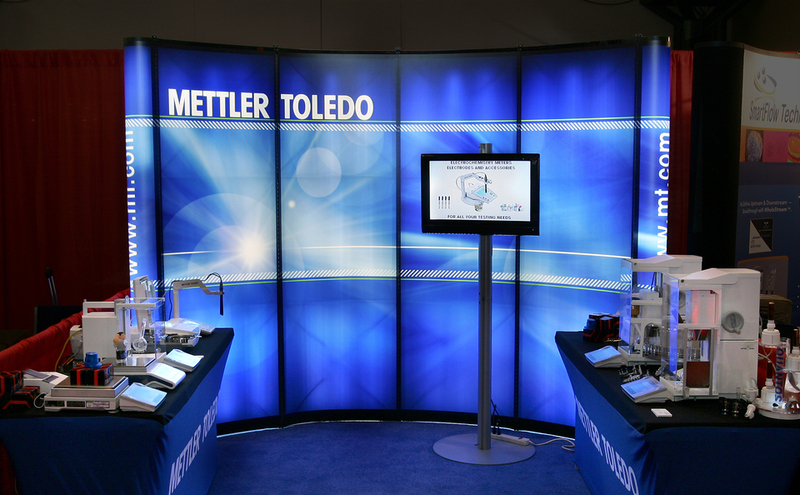 monitors on their 10' curved Mirage frame. 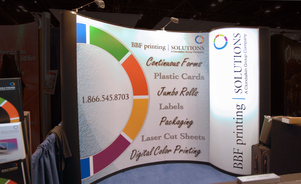 A variety of accessories like shelving, counters and flat screens display your products and message. 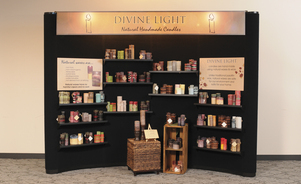 Mirage has shelving, racking and other accessories available to showcase products of all kinds. 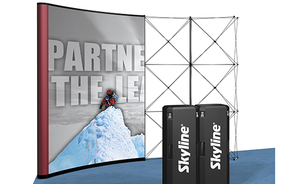 Mirage is designed to accommodate graphics on both front and back for island applications. 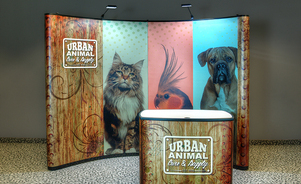 Connect 3 Mirage units together to create an attractive island exhibit. Is Mirage's composite frame more durable than aluminum? 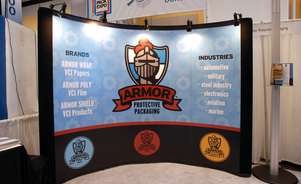 The most durable pop-up frames available. Period. Mirage frames are the most durable in the industry. If impacted, they bounce back without damage -- unlike any other pop-up. 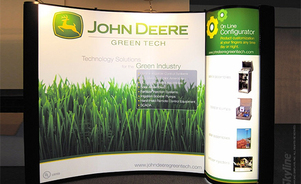 A new logo, changes to two major product lines and a story-telling exhibit produced a happy ending for John Deere-Green Tech. 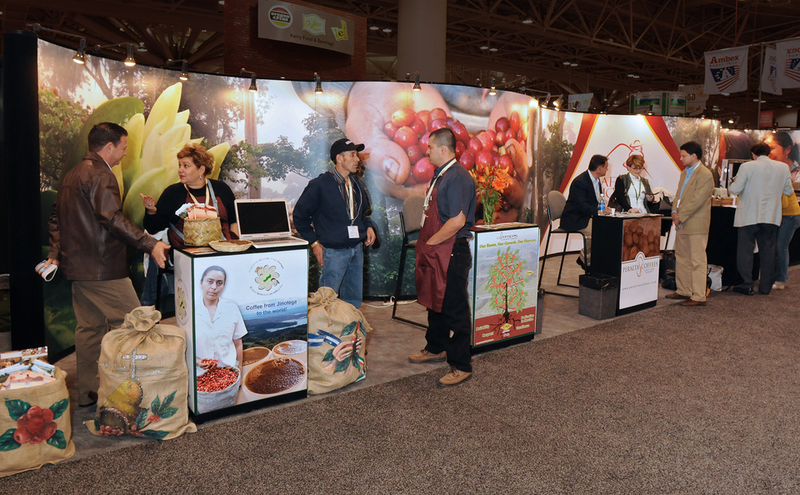 “We had phenomenal results. 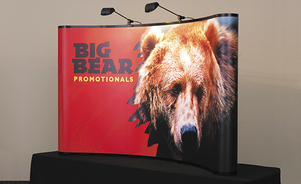 Our new exhibit..."
Known for superior quality, Big Bear Promotionals upgraded to a tabletop display that reflects the company’s image. 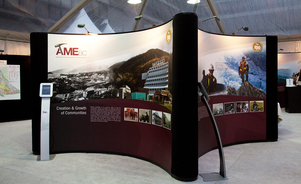 “We wanted to use bold, eye-catching graphics that would..."
With Skyline portable and custom modular systems, you can rent virtually any exhibit design at any size. 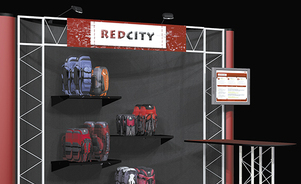 Visit our Rental Catalog to see just some designs we have for rent. 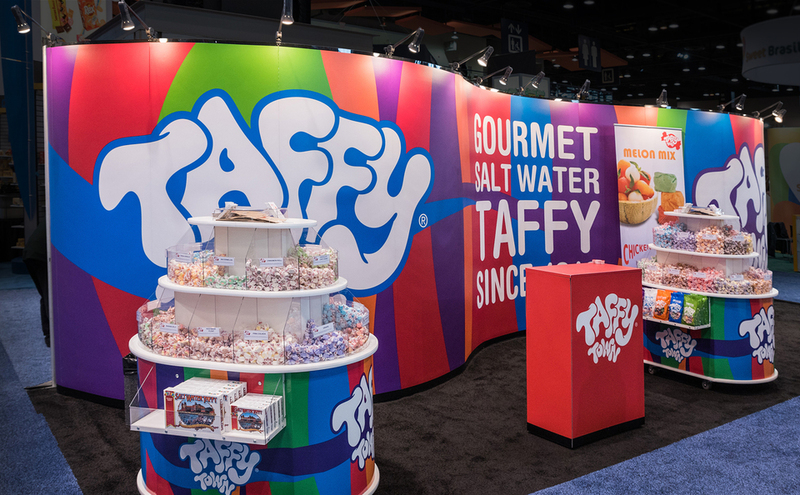 From portable displays to massive custom modular island exhibits, see photos and concepts of exhibits that Skyline designed for a wide variety of exhibiting objectives. Great look and convenience! 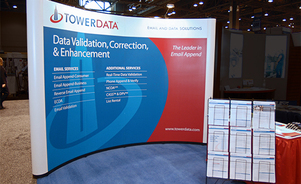 Mirage® pop-up displays give you a classic curved look and big, seamless graphics. Mirage is easy to set up, ship, and transport. After you request an electronic version of this brochure, you will have the option to also request a hard copy version as well. Please check your email after you submit your request for a link to this form.